We have a pond in our neighborhood. It belongs to an apartment. My 3 year old daughter is fascinated by that as all other kids do. There are a lot ducks living there. The most amazing thing is that some duck eggs and little ducklings appear "sometimes". The ducks lay eggs in a certain place, then they hatch them into ducklings. The female ducks willingly bear the burden of hard works. They lay eggs, hatch into ducklings, and take care the ducklings. They are real respectable mothers. Not all the ducklings can grow up. They are preyed by the hawks all the time. Today we see one mom duck leading 12 ducklings, the next day I see only 4 of them. That is why I say we can see them "sometimes". That is the most pathetic thing happens to my daughter. Every time when she saw this happens, she burst into tears and promised to kill the hawk one day. We have a pond in our neighborhood. It belongs to an the apartment owners. My 3-year-old daughter is fascinated by that it and so are manyother kids. There are lots of ducks living there. The most amazing thing is that there are some duck eggs and sometimes little ducklings appear. The ducks lay eggs in a certain place, then they hatch and become ducklings. The female ducks willingly bear the burden of this hard work. They lay eggs, hatch them, and then take care of the ducklings. They are real respectable mothers. Not all the ducklings can grow up. They are preyed upon hawks all the time. 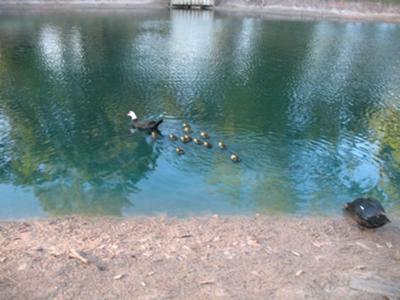 Today we may see one mom duck leading 12 ducklings; the next day I may only see 4 of them. That is why I say we see them "sometimes". The most pathetic thing happens to my daughter. Every time when she sees this happens, she bursts into tears. She promised to kill the hawk one day.